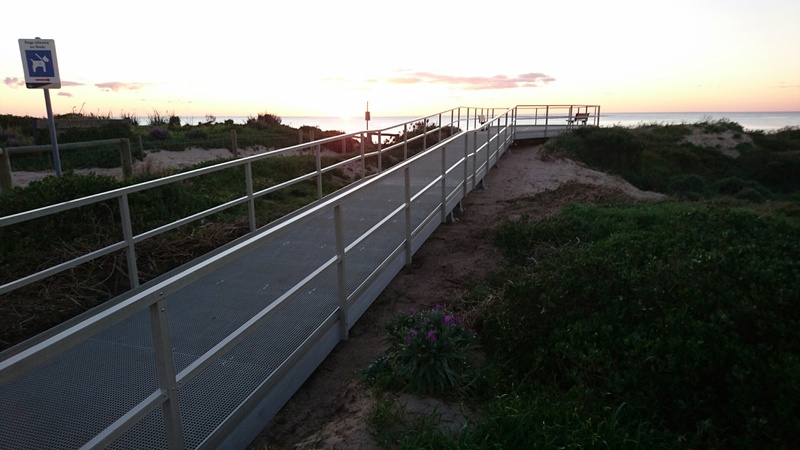 Walcon’s newly designed Advantage Series boardwalk system has just been installed on the sand dunes, overlooking the magnificent Indian Ocean in Mandurah, WA. Manufactured completely in FRP, the Advantage Series boardwalk and viewing platform is the ideal structure for the City of Mandurah. Being non-corrosive, FRP is the perfect solution being low maintenance and long-lasting, reducing long term expenses on upkeep. The boardwalk system sits on top of the unique and non-invasive Diamond Pier footing system. Unlike many other footing options, Diamond Piers do not require excavation, reducing disturbance to the surrounding environment. Walcon also carried out the fabrication in its factory, reducing on site labour, again minimising the impact on the environment. The structure was installed on sensitive dunes and no plant or heavy equipment was required. Works were carried out within the boardwalk footprint to protect the surrounding dunes and foliage. Walcon offers a wide variety of optional accessories such as seating and handrails. Additionally, the FRP can be manufactured in custom colours to suit or provide contrast to the surrounding environment. Unlike other conventional materials such as timber, steel and concrete, FRP is extremely low maintenance due to its non-corrosive properties. Advantage Series boardwalk systems are modular in design and allow civil structures to be built in remote, rural and environmentally sensitive locations. As FRP is so lightweight, the boardwalk modules are easily handled in to place and secured to the legs/posts – eliminating any requirement for heavy plant equipment to enter the work site.